The logic of this format is simple: ‘Many schools choose to plan their Geography and History together. This format is aimed at helping you to do precisely that, in a way that both strengthens each subject’s distinctive contribution to learning, while also highlighting some of the common threads between the past and the present’. Both authors have lengthy experience both of teaching these two subjects and of writing widely for primary and secondary age ranges. 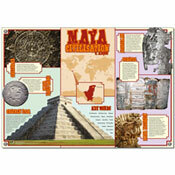 With minimal illustrations, the text in each case, based around seven ‘enquiry questions’, is carefully structured to guide teachers towards not only basic information on the Maya but also ‘what an enquiry might look like in an upper primary History [or Geography] classroom’ - each double-page comprising Teaching ideas backed up with boxes on Core Knowledge, Extension Work, External Resources and CPD questions. 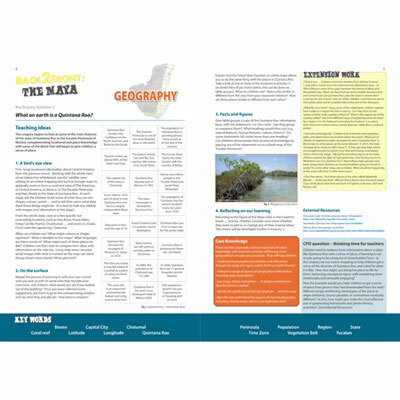 This resource is for teachers, not pupils, and Ballin and Wilkinson share many years of prime experience leading workshops for teachers run by the Geographical and Historical Associations. 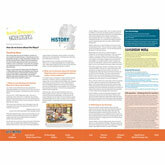 At every stage this resource encourages teachers constantly to check basic skills and concepts and to ground their topic work in the guidelines of the National Curriculum History document, emphasising the need to inspire curiosity, to use evidence critically, to consider arguments, for children to be asking questions as much as the teacher, and ‘to develop a coherent knowledge and understanding of the history of our own country and the wider world’. • Who were the Maya? • How did the Maya explain the world they lived in? • Were all Maya cities the same? • How do we know about the Maya? • What happened to the Maya around 900AD? • Why should we remember the Maya? We will focus in this review on the History ‘half’, since we feel more qualified to comment on it. The quality of the resource overall is very high, particularly with regard to the guidelines and support it gives to teachers who are new to the topic of the ancient Maya. We could find no fault with the resources listed, the extension work suggestions and the CPD questions it explores. When it comes to content accuracy, we have only one significant criticism: the use of the term ‘Maya Empire’. Unlike the Aztecs, who DID build an empire, the capital of which was Tenochtitlan, Maya civilisation consisted of a large number of independent city-states spread over a wide area; essentially these either traded peacefully with each other or engaged in warfare as mutual rivals. Lacking any central ruler or monarch, this was in no way an empire. • Call us old-fashioned, but we don’t like seeing the term ‘replica’ being used to describe cheap, tacky items usually coughed up for the tourist market in Mexico (commercial companies are notorious for labelling these as ‘replica artefacts’). A replica by definition is an EXACT copy of the original - everything else is a copy, and all too often (as here) a stylised and fanciful copy of something with no basis in historical fact. • We would query where the idea that ‘the historical Maya had around 38 different gods’ (p.10) comes from. 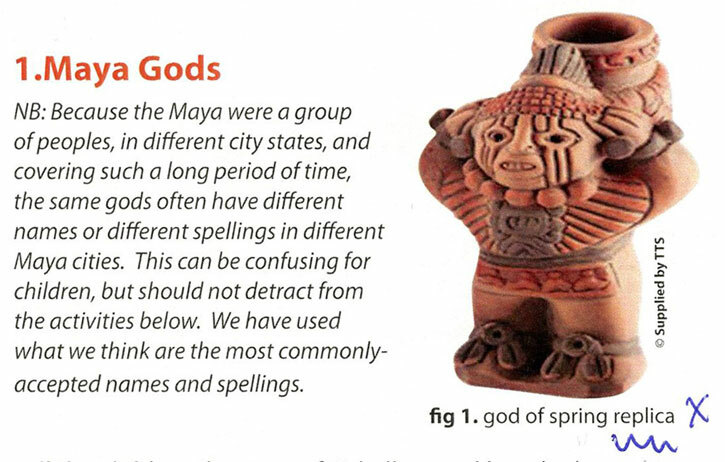 No-one knows how many Maya deities there were, and it’s pointless trying to put any sort of precise figure on it. We think it more useful to focus on the dozen or so really key ones that were widely worshipped, such as Itzamná (follow link below). • Suggesting that the Classic Maya might have been ‘destroyed by invaders from the Andes’ as one of the ‘main interpretations’ of the famous Maya Collapse (p. 16) is decidedly fanciful. We’ve never seen any historical evidence at all of Maya-Inca contact. • In discussing the achievements of the Maya (p. 18) the authors suggest that their calendar ‘was as accurate as ours’. In fact their solar calendar (they had others as well) was much MORE accurate than ours at the time. • We were sorry not to see any reference to the size of the Maya population before the arrival of the Spanish. Most scholars have suggested at least 13 million, and this number has recently been shown to be a significant under-estimate, thanks to the pioneering use of LIDAR, revealing the presence of thousands of previously unseen buildings hidden beneath the rainforest canopy. • Finally, amazed that in this day and age Caribbean should be mis-spelt on the big double-page map, clearly designed for kids! Still, overall this resource is RECOMMENDED. RRP £14.99.